Artists’ Reception: Friday, Oct. 16, 5 –9 p.m.
(Above: That-A-Way by Philip Morsberger. 2002-2006. Oil on canvas. Sunday, 1 – 5 p.m. Weekdays, 11 a.m. – 7 p.m. and by appointment. With its two simultaneous solo exhibitions at Gallery 80808/Vista Studios in Columbia, S.C., if ART Gallery introduces the widely revered painter Philip Morsberger. Morsberger is the former head of the Oxford University art department in England; he recently joined if ART Gallery. 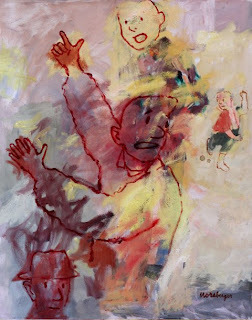 Along with the Morsberger’s show, Time Travelers, if ART presents Columbia native and resident David Yaghjian’s solo exhibition Dancing Man. Yaghjian’s will be his first solo exhibition in Columbia since 2000, when he exhibited at the now-defunct Morris Gallery. The exhibition will also be Yaghjian’s first solo exhibition featuring his “every man” series, which he began to develop some five years ago. Morsberger (b. 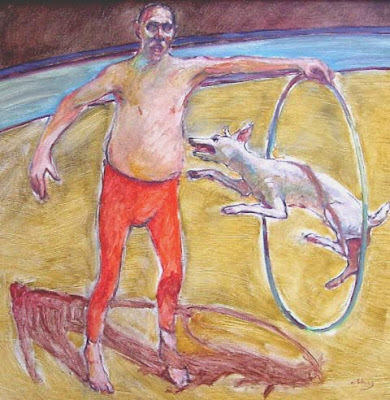 1933) will be showing a selection of the vigorously painted and drawn figurative/representational works inhabited with cartoon-like and other creatures for which he is known. The exhibition also will include Morberger’s non-objective paintings, in which he develops an abstract-expressionist approach that also often shows through in his representational work. 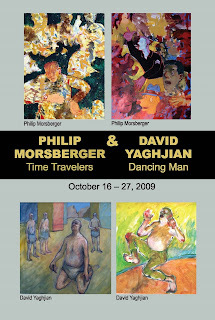 In the 2007 book Philip Morsberger: A Passion for Painting, author Christopher Loyd writes of Morsberger’s “mythical universe, comprising a whole cast of fantastical creatures, both human and animal. 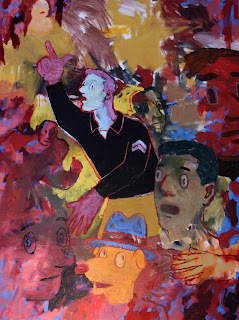 . . All these creatures inhabit a turbulent, chaotic world that is hugely energized and dominated by a mood of restlessness.” About Morsberger’s use of colors, Loyd writes: “Color is a distinctive feature of the recent narrative paintings . . . The colors sing on the canvas.” Baltimore native Morsberger studied at Oxford in the mid-1950s and from 1971-1984 was the university’s Ruskin Master of Drawing. He used the prestigious position to develop and head a now renowned, full-blown art department at Oxford University. In the United States, Morsberger has taught at Harvard University, Dartmouth University, UC Berkeley, the California College of Arts and Crafts, Miami University and other institutions. He retired from teaching after a five-year stint as Williams S. Morris Eminent Scholar in Art at Augusta State University in Augusta, Ga. His work is in several museums, including the San Francisco Museum of Art. 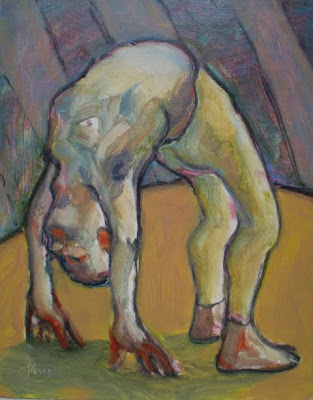 Yaghjian has exhibited across the Carolinas, including at the Blue Spiral I Gallery in Asheville, N.C., if ART Gallery and the Florence (S.C.) Museum of Art. In Atlanta, where he used to live, Yaghjian has shown in the Spruill Center Gallery, the Right Brain Gallery and other venues. He also painted two murals in the Georgia capital. Yaghjian holds a BA from Massachussetts’ Amherst College and studied in New York City at the Art Students League and the School of Visual Art. Among his instructors were Fairfield Porter, Leonard Baskin, Will Barnett and Chaim Koppelman.